9 posts categorized "Food and Drink"
supper is almost ready by CherrySoda! As a twenty-something enthusiastically rattling about the wilds of New York City, I treated my kitchen merely as a room which held another sink (in addition to the bathroom). I also stored cookbooks there, which I read with great passion yet from which I never cooked. 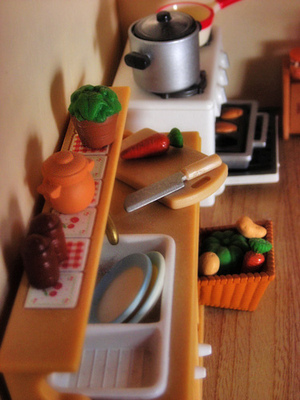 The hearth of my petite urban abode remained a mausoleum to my lost art of preparing food. I had plenty of encouragement in my culinary neglect. My cousin residing on the city's Upper West Side had a stack of take-out menus which she affectionately referred to as her "recipes." A co-worker living on the Upper East Side used her oven to store her dry cleaning. Our trio wore our anti-cooking badges with honor. In the "city which doesn't eat at home," we were not alone. Returning home late from work, or, more likely, returning home very late from being out with friends, I'd almost always grabbed something on the way there. ("So sorry, my Kitchen, I've already eaten!") Somewhere amongst the thousands of delicious and affordable restaurants and cafes Gotham offered me. Someplace more fun, where I could talk and laugh and people-watch and sample other lives and cultures, through both my eyes and palate. Someplace where I wasn't alone. Cooking by myself in my kitchen made me feel lonely. As I wasn't a particularly good cook, I had no ability to whip up delicious meals to successfully entice an entire social life over to my pad. It was pasta and sauce, mac and cheese, beans and rice almost every night. I was unable to envision anything beyond beige carbs. Taking action in my kitchen made me feel like a failure. So I headed to my hearths away from home to be fed, among them family pizza parlors in downtown Brooklyn, falafel hot-spots in Greenwich Village, and noodle shops with jade-green veggie dumplings in the East Village. Let me stay in the East Village a moment: luscious berry smoothies with flax seed oil added for extra Omega 3s; all-I-could-eat, home-style, buffet Indian food complete with tabla and sitar players AND mango lassis; frite shops instantly dispensing fresh crisped potatoes; Bento boxes featuring incredibly edible sushi. Then I found something intriguing: a vegan restaurant which featured a community table. Total strangers were welcomed to take a meal, sit next to someone they probably didn't know, and see what happened. Sometimes talking and laughing happened. Often people read quietly to themselves as they ate, sitting next to other solitary reading people. Those restaurants, run with so much care and passion, supported me as I grew into my full adulthood. Because many opened their kitchens to feed me and countless others, I was nourished, for as long as I needed, until I took a few cooking classes and began to nourish myself. For more takes on "in the kitchen," click here. Happy 1st Birthday, Sunday Scribblings! It's amazing how Web 2.0 technology is connecting people. Based on my own experience, I can attest that people are creating vibrant, supportive creative and writing communities and are collaborating on projects. 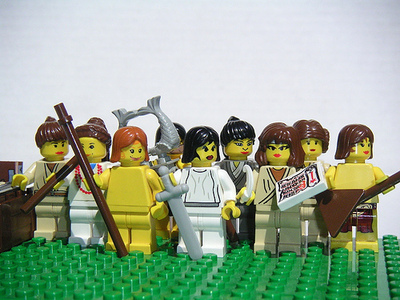 I've heard of an adventurous group writing a novel together — and none of them have ever met (can't find this link!). On PSFK today, I've posted about one such community soon to launch. Curious Fork/Furious Cork promises to be interesting, innovative and yummy. What I'd like to see next are some creative communities working to solve global conflicts, hunger, illiteracy and poverty. Anybody know of any? Anybody interested in working on these? I'm sure they are out there. Please leave a comment. 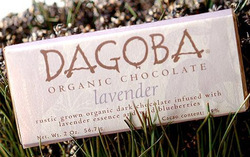 Behold an image of Dagoba's LAVENDER organic chocolate bar. Why am I writing about this? Because I've tasted almost every type of chocolate I've ever had access to, and none actually slowed me down while I consumed it. With this bar, I took small bites, savoring them. It took me three entire evenings to actually finish one bar. I usually gulp chocolate in some vacuum-like frenzy, tasting little and consuming much in record time; I feel silly afterwards, a bit guilty, and vow to slow down next foray. With the Dagoba, I felt reflective. I smelled the chocolate slowly and noticed that the lavender aroma was so strong, yet the taste of it was barely there. It's dark chocolate infused with lavender essence througout. It is subtle, thought-provoking. Sense-provoking is probably more accurate. Wild blueberries peppered throughout the chocolate round out this unusual, delicious combination. Dagoba talks of its research into the "alchemy of chocolate." Alchemy is chemistry, but, as importantly, it is also magic. And in small type on the back of its wrapper, they mention their philosophy: "You can deprive the body, but the soul needs chocolate." Enough said. I didn't plan to write food or product reviews on this blog, but I wish I'd bought more. Quit the "Clean Plate Club"
Study: Strict parenting might lead to obese kids. "CHICAGO, Illinois (AP) -- 'Clean your plate or else!' and other authoritarian approaches to parenting might lead to overweight children, a new study finds. "Strict mothers were nearly five times more likely to raise tubby first-graders than mothers who treated their children with flexibility and respect while also setting clear rules." Here's my reasoning: If a child feels full, yet a parent makes them continue to eat, the child learns that their own feelings of being full should be ignored. With this self-denial repeated meal after meal, day after day, children become so disconnected from what it feels to be hungry or full that they eventually cannot regulate themselves. This can lead to overeating because kids can no longer "hear" their bodies when their bodies say, "Full! Enough! Stop eating!" Here's another dire consequence: When a parent encourages children to ignore their own feelings, I think this extends to other areas, too. After being made to ignore such a basic human experience of hunger/fullness, what else will children ignore in themselves? Being sad? Happy? Confused? Do all feelings now get pushed a little deeper down inside? If so, this can lead to depression. There is something else at work here. Children spend their early years just learning about which foods they like. It is said that it takes 10-20 tries for some kids to decide if they like a new food. 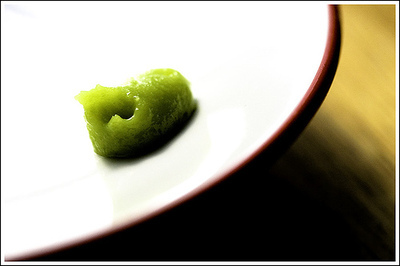 It is a natural process for a child to refuse food at certain times. Strict-feeding regimens short-circuit this developmentally appropriate approach. We all know people who were forced to clean their plates as children, often under threat of punishment. For those that I know, mealtimes and eating remain a source of conflict and discomfort. Shouldn't eating be enjoyable instead of stressful and miserable? Indeed, it seems that children's quality of life depends on it.